Bangon Kali posted this article on how to listen for signals from an Arduino through the Serial Port (Linux, Mac) or COM Port (Windows) using the SerialPort2 Node.JS module and serve signal data to the web in real time using Socket.IO. 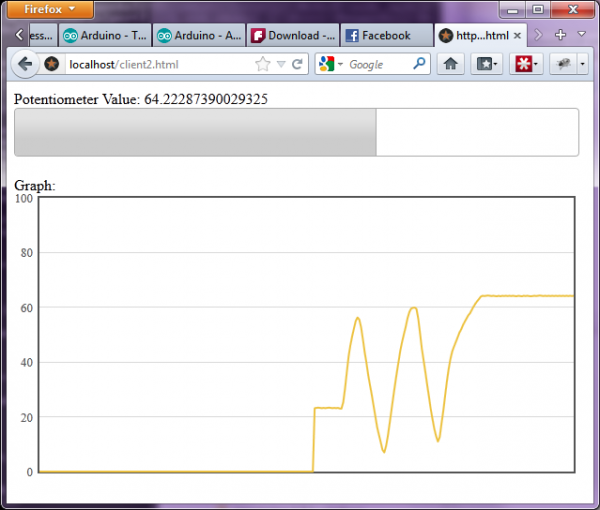 This entry was posted on Sunday, June 3rd, 2012 at 12:01 am	and is filed under Arduino, code. You can follow any responses to this entry through the RSS 2.0 feed. You can skip to the end and leave a response. Pinging is currently not allowed. Actually you don’t HAVE to use WampServer for this (which is a Windows binary install), any web server and back-end scripting language would suffice (I like Apache and Perl). The rest of this project is Java based, so it is cross-platform. Dang it! Now I see that there are so many broken (loopback) links in the original article that it makes the whole thing useless! Hello, I am the author of the article that you are referring to. Thank you for reviewing things. It has been a while since I have written it. I will try to check and see if there is something to be fixed on the article. Thank you very much.